This is not intended to discourage you from adopting a Boxer, we would just like for you to understand and be informed of what kind of commitment it takes to be a responsible pet owner, especially when you’re planning on adopting a rescue Boxer from ABR. It’s also very important to do your homework on the Boxer breed and find out if the Boxer lifestyle is for you  you can find out more on Meet the Boxer. First off, most of the dogs that we have for adoption will have come from less desirable situations. That is, they may have been abandoned or sometimes abused, they arrive in shelters malnourished and sometimes suffering from disease such as mange or heartworm. By the time these dogs reach a rescue group they been through a lot. Please understand that the adoption and home visit process isn’t to designed to be frustrating and drawn out, but we will make sure that before a dog leaves ABR we have conducted a thorough reference check and completed a home visit. We will make sure that each pet in that home has been neutered/spayed and is up to date on all their shots. As everyone in this organization works outside of the home and has their own families and animals, please understand that this all takes time  we are all volunteers. ABR has no full-time or paid staff. Note that we will not adopt outside of the Greater Atlanta area  no exceptions. 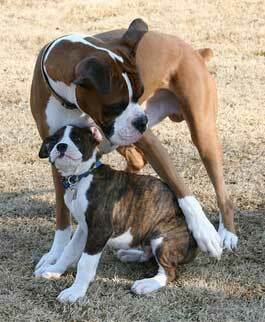 There are many Boxer rescues throughout the US, you can click here to find a Boxer rescue in your area. All of our dogs are located in foster homes. We will not make arrangements for you to meet the dogs in the foster home until you have completed the adoption application and the home visit process - we want to ensure the best fit for each individual foster Boxer and applicant. Our foster “moms and dads” dedicate their time and money to loving and training these dogs and we rely on their input when meeting with a potential adopter. Understand that owning a pet can be expensive. You have food, heartworm medication, and flea & tick medication monthly, yearly shots and then  well life, the unexpected trip (or 2) to the emergency vet, maybe surgery  the list can go on. Not being prepared for the “oops” in life is how some of these beautiful Boxers end up as owner surrenders to a shelter, not through any fault of the dog, but by an owner not understanding the expense that can be involved when owning a pet. We do want you to know the joys of owning a Boxer, the unconditional love, the Boxer kisses, the kidney dance  all the things we love about the breed  but we also want you to know that this is a big commitment of time, energy and money. So, if you are ready to make a commitment to a Boxer, here is the adoption application.